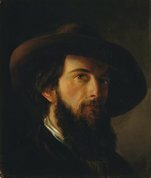 Arthur Anderson Fraser was a member of the Fraser family of artists, hailing originally from Scotland but settled since the middle of the 19th century in the town of Bedford in the east of England. Of his six brothers and two sisters, Arthur was the most enthusiastic and loyal supporter of the Jacobite cause, founding a White Cockade Club when he was in his late twenties. Arthur’s brothers were Francis Arthur Fraser, Robert Winchester Fraser, Michie Forbes Fraser, Garden William Fraser, George Gordon Fraser and Gilbert Baird Fraser. Born between 1846 and 1865, all of them became painters except Michie, who joined the consular service. Without children of his own, he was able to provide financially for his less well-off brothers. Apart from Francis, who was a genre painter and illustrator, the Fraser fraternity worked predominantly as landscape watercolourists in what might be described as a generic Fraser style that was forged through mutual influence and assistance, though Garden William Fraser was arguably the most talented of the group. Their paintings represent for the most part a small, secluded corner of rural East Anglia, and are characterised at their best by limpid colours and a feeling of almost frozen stillness and clarity. Arthur was largely self-taught as an artist. His only formal instruction in drawing appears to have been at his local grammar school in Bedford. 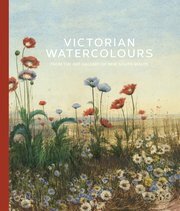 Nevertheless, by the early 1880s his advancing skills as a watercolourist resulted in several works being accepted for exhibition at the Society of British Artists and the Royal Institute of Painters in Water Colours, as well as at annual art exhibitions in Bedford and Manchester. The delicate brushwork of which Arthur was capable can be seen in his painting of frosty branches in Bromham Park , which evokes a chilly landscape with a presage of spring in the air. Arthur was inclined towards tranquil country scenes, with a fondness for the woods, fields and towpaths along the stretch of the River Great Ouse between Bedfordshire and Cambridgeshire. He signed his early watercolours ‘A Anderson’; later he used ‘Anderson Fraser’, ‘A Anderson Fraser’ or the initials ‘AF’.